Since January 2000, the Miller Gallery has sought to support the creation, growth, and understanding of contemporary art through exhibitions, projects, events and publications. A non-collecting facility located in the Purnell Center for the Arts on the main campus of Carnegie Mellon, the Gallery is named for Regina Gouger Miller, alumna of the School of Art, avid art collector, and generous principal donor. The 9,000 square foot space functions less as a showroom for art, than one for experimentation, examination, discovery and discussion. The gallery aspires to engage diverse audiences, as well as to stimulate, provoke and encourage contemplation of the visual arts of our times. PITTSBURGH—Carnegie Mellon University's Regina Gouger Miller Gallery will open "Tides," a new group exhibition that includes compelling photographs, paintings, sculpture, videos and performances by nine of the most innovative artists working in Northern Ireland. 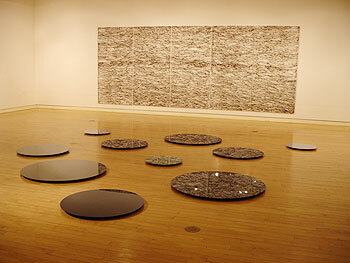 The exhibition opens this Thursday, Jan. 25, with a public reception from 5 to 8 p.m. "Tides" will run through March 30. Artists include Ian Charlesworth, Seamus Harahan, Michael Hogg, Sandra Johnston, Darren Murray, Aisling O'Beirn, Mary McIntyre, Peter Richards and Alistair Wilson. Johnston, a performance artist, will present her work at 12:30 p.m., Friday, Jan. 26, in the College of Fine Arts Great Hall. "These artists address a variety of subjects, in many different mediums, to explain the range of issues still permeating Northern Ireland and also what it might mean to be an artist in a place undergoing political transition," said Hilary Robinson, the Stanley and Marcia Gumberg Dean of the College of Fine Arts. "Our hope is audiences will get a sense of contemporary Northern Ireland, viewing a place where there is hope as well as the legacy of much conflict." Gallery hours are 11:30 a.m. to 5 p.m., Tuesday–Sunday. The Regina Gouger Miller Gallery is located in the Purnell Center for the Arts, 5000 Forbes Avenue, on Carnegie Mellon's campus. Parking is available in the East Campus Parking Garage, which is free after 5 p.m. on weekdays and all weekend. The Morewood Lot is also free on weekends. For more information or for digital images of representative work, contact Jenny Strayer at 412-268-3877 or jstrayer@andrew.cmu.edu. For biographies of the artists, visit millergallery.cfa.cmu.edu.